I am looking for a dos game I played in 1996 in which there was a heroine with boomerang and I think with a bow. The game was 2D. It was a game like the Golden Axe. I do remember that in several levels there were crocodiles as enemies you have to pass. I thought the name of the game was "Amazones", because the places the levels are look like the Amazon, but I found nothing in the internet. If anyone knows its title please let me know. I can also say it looks like the "Vinyl Goddess From Mars" or "Jill of the Jungle" if that helps, I downloaded both of them, but the game I remember isn't one of them. If anyone knows just post the name of the game or a screenshot. No one? Can anybody help me? I'm hoping someone can help as it's driving me nuts!! I used to play a playstation one game, demo I think, as a two player deathmatch type set up. Each player was a futuristic person, i think in red and blue, and you started in a warehousey green type building at opposite ends. You had to run around and collect guns and then find the other player and shoot them basically! I remember the guns weren't proper type ones and one was called a ricochet, it shot a ball out which then ricochetted around, there was a voice which used to say the names of the guns when you picked them up. First post here, pretty desperate and in a state of utter brain burn! dystopian setting, a pretty grey future world, i think a first person adventure game, contains world government elements etc, a massive sub/railway system connects all major european cities. probably published after 2004. any help? Could it be Soho ? Hey guys, could you help me? I'm looking for a game from 1990-1996 maybe. It was a windows 95 game i think or maybe it was on DOS too. Well the game is like: It was an adventure game, you were in a castle you saw your character (an old man some wizzard like) ffrom over. You need to walk in the castle doing spells, fighting with monsters soleving puzzles and something like that. It was my favorit game and this is waht i only remember. So please help me find it. Ok gang... I need help as well! Sometime between 1992 and 1993 I played this game, and I believe that it was for either the Sega Genesis or SNES, I can't really be sure, as I had BOTH systems permanently set up. Anyway, the game was a side-scrolling action/fantasy game, with the main character being somewhat of a "Conan/Warrior"-type, complete with a sword (and if memory serves, the ONLY weapon) that can be "powered-up" when running into, or picking up items along the way. As the "bad guys" came at him from both sides, he proceeded to kill them until a "boss" came into the picture. There was some climbing and jumping, but very little. I also remember that this game was not very long because it took me only two days to get to the end. Upon killing the final boss, the part of the game that stands out is... the MUSIC! As the credits began to roll, and all of the bosses were "introduced", the background music was REALLY COOL!! Sadly, this is all I can remember about this game. I am pretty sure that it was a Genesis cart, but for the life of me, I still cannot remember it's name because I RENTED IT from Blockbuster Video!! I'm trying to find this game too! I do not remember the name, but the game is 2D, the goal is to make the mole pink skip the platform without touching the obstacles and reach the other side, to stay with his "family". I just remember that one of the passwords of the game was called "hotel". If any forum member to remember the name of this game, please tell me. Thank you! so i first played this game as a downloaded demo a few yrs back (around 2010) I think on PS3 but there's very small chance it was on the 360. its a flying shooter game but in no way a flight sim. very futuristic setting. robotic type flying enemies. the level i played had the player flying through a city with many tall buildings and many advertisement (billboards) that were also obstacles to be avoided or shot through. it was not strictly a side scroller either. At times the camera angle would change and you'd be flying into the city (which would be like flying into the screen) and even down the length of the buildings (kinda like that scene from fifth element). the level ended with a boss battle but i can't for the life of me remember any details about it. The most memorable traits were the high speed flying/shooting through the epic cyber-style city while dodging ads and blowing stuff up. I'd be eternally grateful to anyone who can help me re-find this game. UGHHH I have 4 games I dont remember its name. from a red truck and then you jump over a fence and then you fight baddies. You wear a white shirt and red boots. and Its a BIT eagle view. and other one is blue. Its a minigame fest and its a 2 player game. You walk the player vertically and it moves foward automatically. by jumping on them. Oh you can enter pipes. it's just fit perfectly in your description. If the you are correct, and the sticks move vertically, then i totally don't know, sorry. Im thinking "Legend of Kage"
Lots of jumping, Fire breathing Samurai, amongst other things. My amigo is attempting to recall the name of a game he used to play. His description is as such: "you are a kid in college and you find out you have this magic power in your arm its sort of like final fantasy but you only use your mystic arm to fight with and you get team mates and awesome powers also it's for the xbox 360" So yeah, help and shiz? Thanks. [SOLVED] So here goes... I played this game as a kid, somewhere between 2000 and 2005. It was a relatively detailed 2D platform medieval game, with jumping/swinging mechanics, along with swordplay and the likes. You started off in a forest, amidst burning wreckage from a seemingly burned down village. As you continue walking right, there was a burning wagon with (pretty sure) the first enemy. There were both underground areas and above ground areas, the underground ones accessible by ladders hidden in tree stumps. There was another level that I remember in a slightly more arid environment, with a gap that needed to be crossed by swinging from a hanging branch or vine. Everything was strictly 2D, with some general theme being about some bird. It MIGHT have been named something to do with "raven" or "dragon", possibly even a part of a series. I know for sure that at one point or other you were fighting off a black bird(s?). Anyone have any ideas? EDIT: After discovering a rather extensive wiki page listing video games that have a prominent dragon theme, turns out that it was "Dragonheart: Fire & Steel". Freaking awesome game, check it out if you have the time. Nope, it isn't legend of kage. The character you play as is completely red and small, like the enemies. The enemies are darker I think dark blue or black and you kill them by shooting some shoryukens at them. Like I said, in the first one you climb up a mountain while killing them, in the second one (or many levels afterwards, can't exactly remember how it was...) you fight them inside a building or something. I also have one game that I've been trying to remember for at least a decade...I never actually played it myself, I just watched a friedn play it. I would guess it was in about 1997but the game might be a little older. It was a point and click adventure, I think you had to retrieve a comb(not sure though), in a desert. one of the things you had to do was getting someones glasses back, which you achieved by making the dude who stole them (not actual humans I think) fall over a rope, and you had to plant corn at some point. That's pretty much all I remember. Sounds like King's Quest 7: The Princeless Bride. I keep getting a malware warning from Avast when opening this page. The message suggests it's tied to a gif. t would be nice if an Escapist moderator could take a look at that. [...]- One game that i remember well, it's a full 2D game where you control a small space ship, and each level have a boss with some minions roaming the screen. the goal is to "draw" lines moving your ship out from the edges, that keeps you safe, creating walls, reducing the free space for the enemy, you complete a level if you're able to cover a % of the map, or destroing the boss if you get some power ups if i remember well. There are, infact, some gray cubes that if you draw a line around it, gives you some power ups, some ones have a red center, those gives you the most powerful ones. The ship is destroid if it touch enemies or an enemy's bullet out the edges, and even if an enemy touch the line you're drowing (it creates a red dot that follow the line really fast and then hit you). There was a time limit, if it expire the ship won't be protected when on edges anymore. 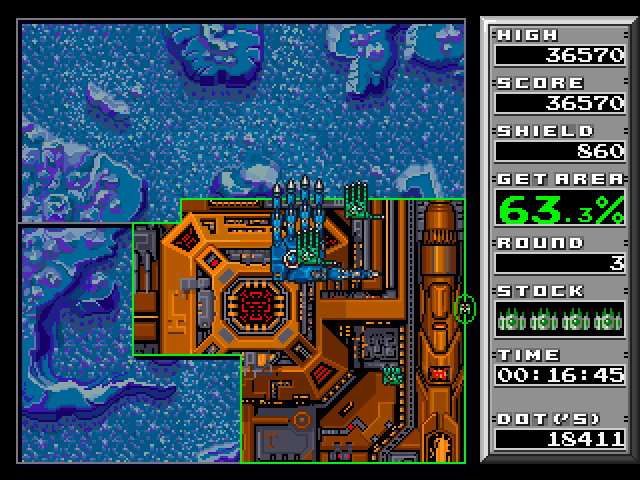 A thing that i remember well is a level that had something like robotics hands as enemies. - A military aircraft simulator, similar to LHX Attack Chopper in some ways, i don't remember a lot of details, but i remember ther was a level where you start from an aircraft carrier, and one level that wants you to intercept some missiles, preventing them to hit a skyscraper (that i didn't ever figured out how to do that). - A cars games, where you could choose between a red ferrari or a white porsche, the other cars race you in game. - Another racing game but on the desert, really 2D-ish, can't remember anthing more about it. i hope i can get some info, and thanks in advice. This is an old PC game I remember kids playing it in school in class. Was really basic had like a stickman and platforms similar to donkey kong where you walk over these squares and they dissapear.If you fall through any of the missing ones you fall straight down. It's not lode runner. Game is prob older but last I remember would be about 93-95. Thanks. I couldn't tell you the exact game, but it's almost definitely a Qix clone. I'm reposting these 2 requests because I really want to find the name of at least the 2D PC Game. I remember this game where you were a dinosaur running around trying to collect eggs. I believe it was a pc game. Possibly 2000. I think the dinosaur was a gilasaurus. Thanks for answering but I found it. Its called Nanosaur. First post here- my head is killing me trying to remember this game. All I remember about this game is that is was probably made in the 90's (I played in maybe 13 years ago? Can't remember) and it was a dinosaur game. You walked around a museum(?) and I remember it being kind of dark and gloomy, and I believe it was first person. The only thing of game play I remember doing is that you could look at bones of the dinosaurs that were on the sides of the museum. I don't remember what else... I have a faint memory of I think digging up the bones? That's all I know! And the graphics weren't cartoon-ish, they were as real as 90's games could provide, and it was a PC game. Any ideas? My brain insists that I know what this game was. It wouldn't be one of the Ninja Gaiden games? I remember some of them having a red/blue tone thing going with the colour scheme, and you would be platforming on a 2D side scrolling level. First post, could you please help me find a game from around 4-5 years ago. It is for the PC, its based on evolution, you start the game as a small fish, start eating other fish then you turn into a small dinosaur and have to survive on an island eating dinosaurs, starting with the small ones. You also can make modifcations to your dinosaur and improve his attack and defense abilities. Hopefully this makes sense to someone and I really appreciate your help. also have another one to ask please, its alot more recent. I used to play Total Annihilation back in the day but a new version was released around 3-4 years ago and was based on a much bigger scale, and I am quite sure they changed the name from Total Annihilation to something else, the desginer is still Chris Taylor. Anyone got any idea what Total Annihilation changed its name to around 3-4 years ago? Similar concept much larger scale? I'm looking for a game I used to play on the computers at my school around 2005-2006. It was an old top-view adventure game, I'm pretty sure in black and white. You wandered the map fighting monsters, and if you found the castle and went through a maze, you could steal all of the king's treasure and fight your way out. I think with the money you could buy spells or potions. Sounds like the SNES game "EVO: Search for Eden"